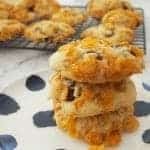 I know you are going to love this classic Cornflake Biscuit recipe! I first shared this easy Cornflake Biscuits recipe on the blog a few years ago, but decided it was in a desperate need of an update – and Thermomix instructions were also needed!! Although these biscuits look time consuming (well they do to me anyway!) they are actually quite quick to make, you will spend most of the prep time rolling and coating the biscuits in cornflakes. We recently made a batch of these Cornflake Biscuits for lunchbox snacks for the boys to kick off the start of Term 3. Mr 6 in particular was intrigued with the fact that I was using cereal to make these biscuits, and was very keen to help me out with the rolling of them – and then taste testing them too as you can see! This recipe makes around 24 good sized biscuits, however if you are making these for younger kids or a crowd, you can instead use a tablespoon to scoop up the mixture to make more biscuits – just make sure you adjust your cooking time accordingly. You can find more great lunchbox recipe ideas (that are also freezer friendly) in this post. Pre-heat your oven to 180 degrees and line 2 trays with baking paper. Place 2 cups of the corn flakes into a large bowl and set aside until needed. Place the softened butter and caster sugar into the bowl of an electric mixer and mix on a high speed for 5 - 6 minutes or until pale and creamy. Add the eggs and vanilla extra and mix on a low speed to combine. Add the bicarb soda and self raising flour and mix on a low speed to combine. Add 1 cup of corn flakes, sultanas and chocolate chips and stir through to combine. Use a dessert spoon to scoop up the mixture and roll into a ball. Place the mixture into the bowl with the extra cornflakes and roll to cover. Place the biscuits onto your baking trays and gently flatten with the palm of your hand. Repeat until all of the mixture has been used. Place the baking trays into your preheated oven and cook for 15 minutes or until golden. Allow the Cornflake biscuits to cool on the baking trays for 5 minutes before carefully transferring to a wire rack to cool completely. You can also use raisins or currants instead of sultanas. Insert the butterfly attachment into your Thermomix bowl and add the softened butter and caster sugar. Mix for 40 seconds, speed 2 or until the mixture is pale and creamy. Add the eggs and vanilla extra and mix for 10 seconds, speed 3. Remove the butterfly attachment and add the self raising flour, coconut and bicarb soda. Using the dough function, mix for 50 seconds or until the mixture comes together. Add 1 cup (35g of corn flakes), sultanas and chocolate chips and use your spatula to combine in the biscuit dough. The time it takes to cream your butter and sugar may vary depending on the temperature of your butter. Have you got your copy of our Snack Attack eBook? You can check out all of our print and eBooks here. A classic from my childhood!! Yummy!! I don’t see why not – yum!! We made them with currants instead of sultanas and added a little lemon essence to the recipe and they were delicious. These biscuits were one of our favourites when we were children. Would it be possible to leave out the sugar or use a sugar alternative?